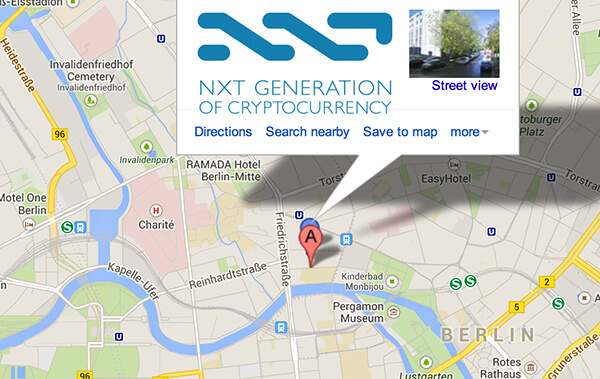 So what took place in the Nxt booth on this beautiful day in crypto wonderland? The Conference was terrific! Such a good vibe all over. It’s clear that crypto is coming out of the woodwork and gaining approval and interest. ALL the people we met were genuinely interested, asked insightful questions about the issues important to them and all people took us seriously as a system. We were cordially received and we are most definitely on the map. People don’t see us as “just an alt” anymore. – GoCoin. Nice guys and some very exciting things going on here. I’ll leave the rest with Justabit as he is lead contact here. – chanc3r met with the CEO of ZipZap. BIG interest there. We expect some very exciting developments here in the medium future here. – Met with Happycoins on the smoking boulevard. They are one of the leading BTC – Fiat companies in Europe. They will be a good contact with connections in banking, legal and governments here. Contact lives in NL, so it will be easy to keep in contact and keep each other informed. – Also managed, with a lot of running to press a card and receive a card from Bobby Lee of BTCChina. He was very busy, but I’ll follow him up after the Conference. I just had a 30 minute talk with Meni Rosenfeld about this [Nxt unfinished whitepaper] and he has given me some things that he would need to actually take Nxt serious at this level. If he has time, he has said that he might be willing to consult. I will get back on this later. – We are now being approached by Venture Capitalists. – We have an investor for the amount of $ 250,000. chanc3r will take lead in this. – We have been invited to a local affair here in NL, which might be a good test case for our local meet ups initiative and have a Nxt meet. The meet is in Arnhem. Still bucketloads of interest here and it’s not diminishing. After resting, we will go over all contacts collected, sort and prioritise follow ups and connect people to other people within the community. I want to thank EvilDave, chanc3r, l8orre, Berzerk and coretechs for their enthousiams, input, voices, hard work and dedication. You guys are ACE and a joy to work with! Thís is how a team works! Also props for your enthousiastic support from the forums, people! Now, I am going to sit behind my screen, sip coffee, eat pizza and have a very content evening! Analysis and stories will follow tomorrow. Charlie Lee came by and got a 15 minute presentation by chanc3r, l8orre and EvilDave! Ooooppsss….crypto geniuses, me and Damelon. But we had really excellent contact with him, probably spent an hour in total over two days, discussing Coinbase and NXT with him. It’ll take much of the next couple of days just to sort out what to do with all of our contacts…..but you guys need to know: NXT is a serious player now. We are seen as pretty much an equal to Ripple and Ethereum, by many of the people who matter in the crypto world. @JustaBit: your conference guide is pretty much perfect. And you’ve been an invaluable support to us in the last few days of lead up to the conference. A sort of steadying hand to show us the right path. I’ve always wanted to keep you (+Cointropolis in general) very much on-board with NXT and this conference has just driven that point home. Me on chief bullshitter and intro duties, Damelon as a slightly more low-key pitch man and contact organiser, l8orre answering the tech questions, chanc3r quietly and very competently manning the booth, Berzerk running around carding and Twittering like a good ‘un, andcoretechs just turning up and helping out with his mad pitching skillz. A really mixed team, all with different strengths and abilities, but the guys turned into the NXT dream team as soon as the conf. kicked off. Gotta repeat that! Thank you so much for your great effort! 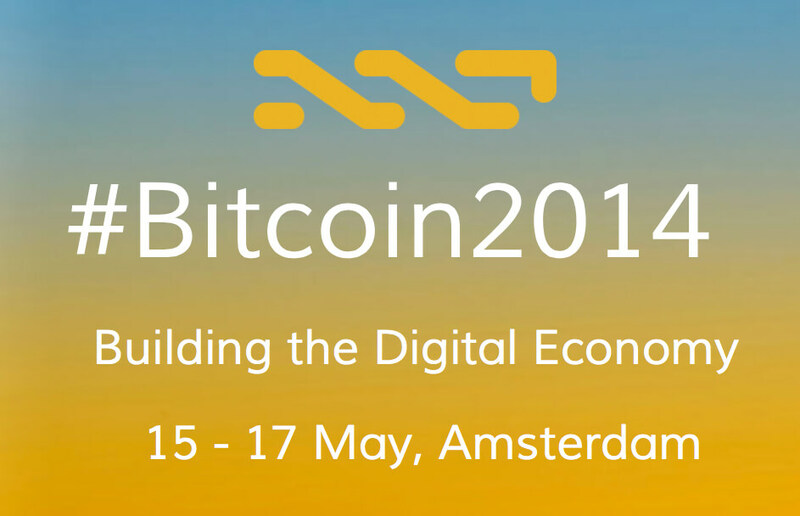 Bitcoin 2014 is the annual international forum, exhibition and networking conference organised by the Bitcoin Foundation for the fintech industry. It’s where investors, technologists, regulators, executives, entrepreneurs, developers, and policymakers gather to collectively shape the future of cryptographic money worldwide. Join us in Amsterdam, one of the most prolific fintech hubs in Europe, to get a glimpse into the future and the opportunity to be a part of building the digital economy. Let’s hear it from the horses’ mouths. How did the representatives of the Nxt Community feel after a long exhausting day in Bitcoinland? We have had so much attention. The day started brilliantly, as Patrick Byrne mentioned Nxt in his keynote speech as one of the projects he finds interesting. This led to a wave of people coming to check out to see that Nxt was. We basically were with 6 people (we met user coretechs at the Conference and he was a brilliant pitcher for us and helped out brilliantly: thank you!) and were occupied most of the time. People came from all walks: we talked to bankers who were interested in the AE, we talked to lawyers interested in developing a legal structure for AE trading, we met normal users, business owners, the generally interested, wallet builders, 2nd Gen collegues (Ripple and Mastercoin), Bitcoin fans etc. etc. We are definitely on the frigging map! Both Dave and I are losing our voices, and we japped our mouths off. l8orre and chanc3r managed the more technical questions, which was needed, because some people really wanted the nitty gritty where I would have just stood slack-jawed if we wouldn’t have had real experts with us. All conference teams should have a dev with them, it’s invaluable and you will be taken much more seriously! Berzerk has been doing rounds all day just making introductions and gathering cards and opening up contacts that we afterwards can follow up. I am very happy that someone actually can work in a “serving” but necessary role. Big props for Berzerk there. Dave managed to combine his volunteer organising tasks with easily chatting with people and getting valuable contacts. We both took the part of basically telling the “story of Nxt” over and over again, so people could grasp that we were new: new code, new blockchain, not a coin but a system, and no, we do not have a chairman, no HQ, we work as a community! We have created loads of follow up opportunities today and we still have a huge wishlist of contacts to visit tomorrow! It’s one of those rare things to get out of a full conference day being pumped instead of tired because YOU have to chase people! Most people came to US! Going to relax a bit now, put my tower of business cards in a safe place and prepare for tomorrow. On behalf of the Conf. Crew, I’d like to apologise for the lousy updates here. The good news is that we can’t update because the NXT booth has been completely overwhelmed with people for pretty much the entire day, It’s very difficult to describe the amazingly positive buzz thats happening here with NXT: it seems as if everyone here is interested in NXT in some way. The buzz is not only about NXT, btw, the whole conference is totally optimistic about the future of crypto, Bitcoin and alts. Its a very powerful feeling. Couple of random things: the RaspPi Solar is a brilliant conversation piece, all the tech dudes love it. Myself and Bas have developed a charging system demo for the solar panel…. as you lift it up towards the overhead lights, the charging boards LEDs start to flash as the current goes up. i think we have that on video, to be posted in a day or so…. Legal aspoects of 2nd generation features (and the legal side of crypto in general) is a recurring theme in teh conversations we’re having. We really need to think very carefully about what we are doing with the AE, for example. Luckily we made some very good legal contacts: Norton Rose Fulbright are the law firm in crypto, and we’ve had about 3 sessions with the guy who is heading up their crypto point group. Had some other lawyers as well…. We will work up a full list of contacts (with proper notes on each) when the conf is over, Sat is the last day. As i said earlier, we are so busy, that any keyboard time at the booth means ignoring interested people. We’ve had 3-5 NXT guys on the booth all day, and I can remember only a couple of periods of a minute or 3 with no-one actually deep in a conversation with an interested attendee. A quote from one ASICS guy: ‘I’m a miner by day, NXT investor by night’ No-one was unfriendly (and i was annoying), the worst response I got was just not very interested. If you can’t get miners to hate on NXT, what is the world coming to? Bitpay gave me some stuffed toys for my kids, and said very firmly that they where NOT going to use anything other than Bitcoin for the forseeable future. They get 10,000 mails per day (maybe I’m exagerating) from alt-coin fanbois requesting their fave alt be used by Bitpay. So I suggest that we simply leave them be for a while, maybe check at the end of the year how they feel. Spoke to 2 exchanges who may want to list NXT, one with a dollar/crypto gateway. Might need help with integration, but they’re not asking for bribes…. This is just a sample, there’s so much more good stuff to share with you lot, but I’ve got to be up early in the AM. I’ll try to post some pics in a bit before I hit my bed. Thank you. I will send you some LOVE on AE. The future will not be centralized. It will be you. And don’t forget to follow his Daily Summaries of the BCT thread HERE. Can someone develop an Nxt equivalent of Proof of Existence so that NMAC (and other Virtual Corporations) can register itself like this companydid on the Bitcoin blockchain? This well written prospectus can also be registered and published using the same method, making it official and “legal”. It gives a greater sense of legitimacy and serves as a show case of how the Nxt ecosystem can provide similar or better safeguards for investors normally enforced through government or centralized means.